Visiting St. Petersburg was the main reason for this entire trip and it didn't disappoint. We had spectacular weather - cool and windy but clear and sunny every day. The Tour Guides kept telling us how lucky we were and we didn't disagree. Because we didn't have Russian Visas, we could only go on organized tours arranged by the cruise ship, but as this was our first visit, we were OK with that. Surprisingly, our visit to the Hermitage Museum, which we visited twice, wasn't the highlight of our visit. Who knew ? There's a lot more to see than just The Hermitage. Our first trip was to the Peterhof Palace, which is about thirty miles outside the center of the city. Visiting the Palace is really a two part process. First, you tour the incredible interior. Then you walk around the park. 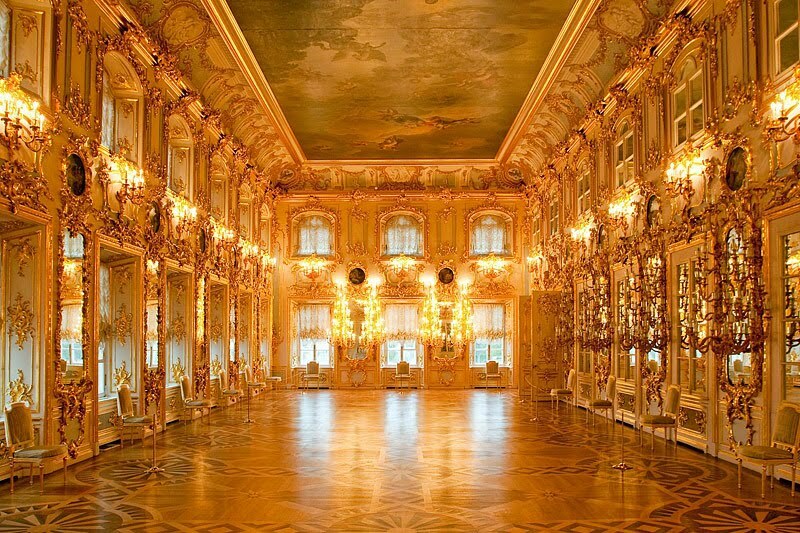 For good reason, it's sometimes known as the "Russian Versailles". Sadly, no photographs are allowed inside the palace. The first view of the entrance to the Peterhof. Gleaming gold spires and of course, it really is gold - gold leaf. And yes - we really were there. 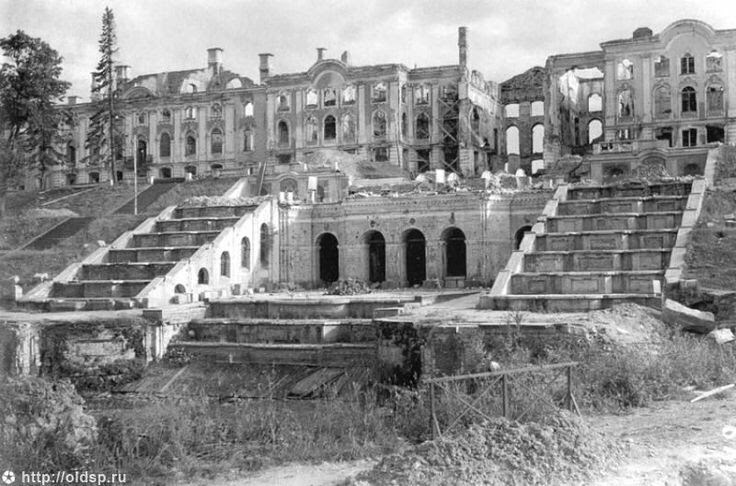 The Palace was occupied by the German army during World War II and when they left, they destroyed it. Restoration started immediately and the place was re-opened in 1947. However, some restoration continues to this day. Once outside, of course, we could take as many pictures as we liked of the grounds and the many fountains. So we did! The gold leaf has recently been renovated so it was gleaming in the sunshine. After about an hour wandering the grounds, we left the Peterhof for our next stop, the Peter and Paul Fortress, in downtown St. Petersburg. 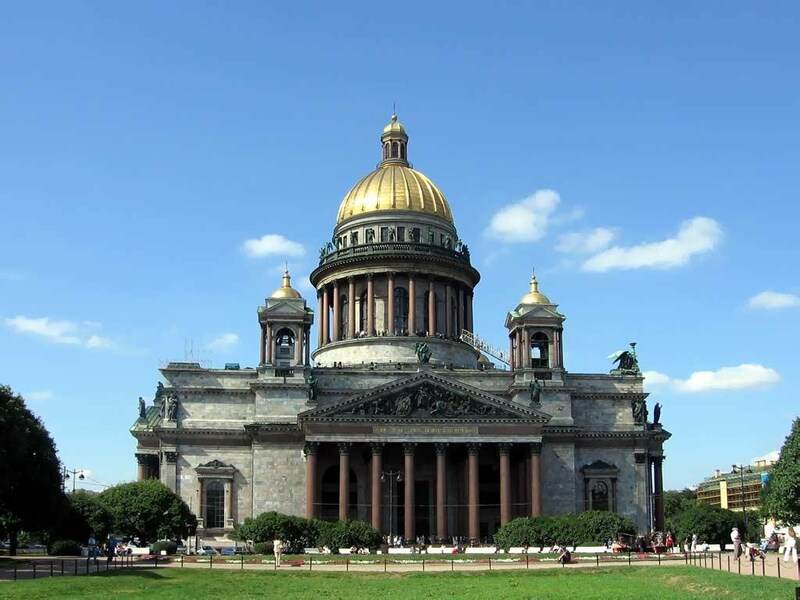 The cathedral is the burial place of all Russian tsars from Peter I to Alexander III, with the exception of Peter II and Ivan VI. The remains of Nicholas II and his family and entourage were re-interred there, in the side St. Catherine’s Chapel, on July 17, 1998, the 80th anniversary of their deaths. Toward the end of 2006, the remains of Dowager Empress Maria Feodorovna were brought from Roskilde Cathedral outside Copenhagen and reinterred next to her husband, Alexander III. We were then taken to see the Church (or Cathedral) of the Saviour on Spilled Blood. 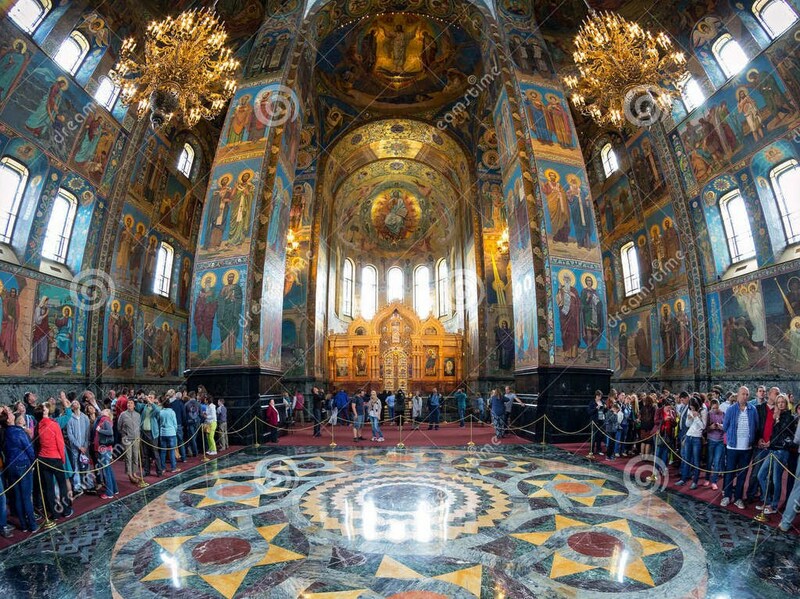 The "spilled blood" was that of Emperor Alexander II who was assassinated at this exact spot in 1881. The church was finished in 1907. When we visited, it was closed for renovation so we only got to see the exterior. The Church was closed the day we visited so this interior shot is not my photograph. The final stop of the day was ANOTHER cathedral, St Isaac's Cathedral, the largest Russian Orthodox Cathedral in the city and the fourth largest cathedral in the world. It was big! It was built between 1818 and 1858 and the dome is 333 feet high. During the communist era, it was used as a museum but after the fall of communism, it was restored as a church. And that was the end of our first day in St. Petersburg. Catherine's Palace was the summer palace of the Tzars and is about 15 miles south of St Petersburg. It opened in 1756. It was built by Empress Elizabeth, who preceded Catherine. Catherine did not like the architectural style chosen by Elizabeth so she hired a Scottish architect, Charles Cameron who refurbished parts of the palace and added a private wing for Catherine's use. The palace fell out of use after Catherine's death and was gutted by the Germans when they left after World War II. Parts of the Palace are still unrestored. The Great Hall of the Palace, where important events such as balls, formal dinners and masquerades would have taken place. It was lit by hundreds of candles (696 in all) placed in front of mirrors (see below). You would think it would have been a bit smoky, as well as hot. But gold was the predominant color and of course gold meant "gold". In most cases the shiny stuff was real gold - gold leaf usually. 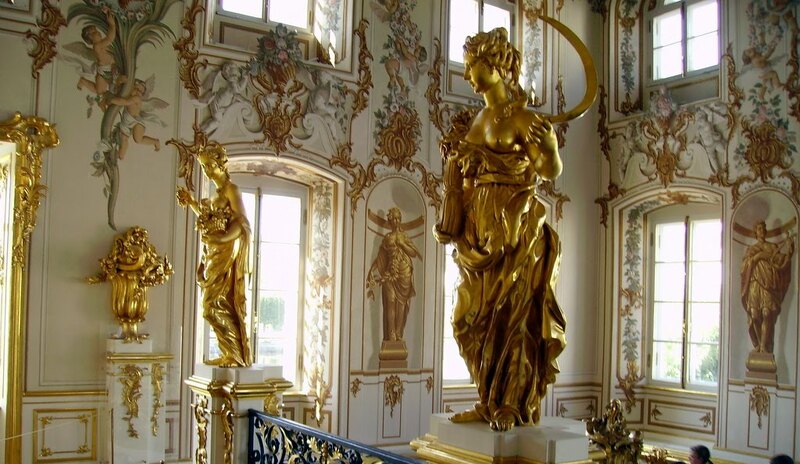 More than 100 kg of gold, worth $3,500.000 at 2015 prices was used in the decoration of the palace. Here you can see a whole series of doorways leading into the distance - each one a different room with a different purpose. 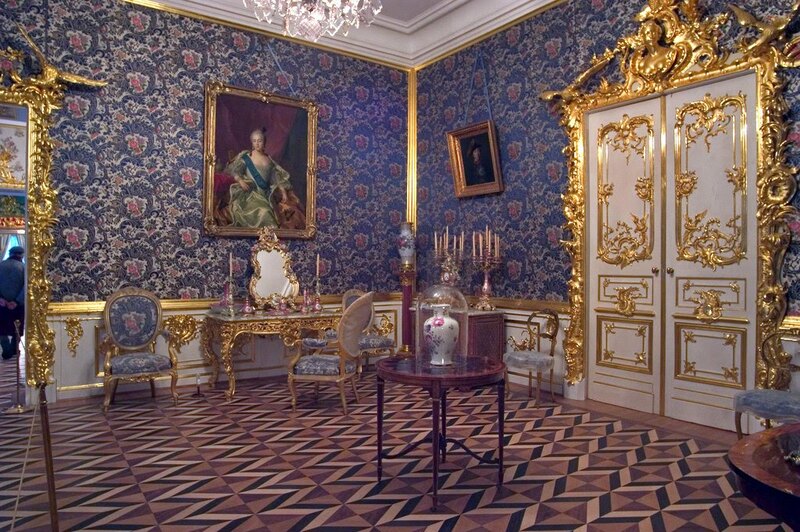 One of those rooms is the "Amber Room" which was stolen by the Nazis during WWII and is still missing. It was reconstructed over 25 years and was completed in 2003. Photography is not allowed in the The Amber Room, so this is not my photograph. 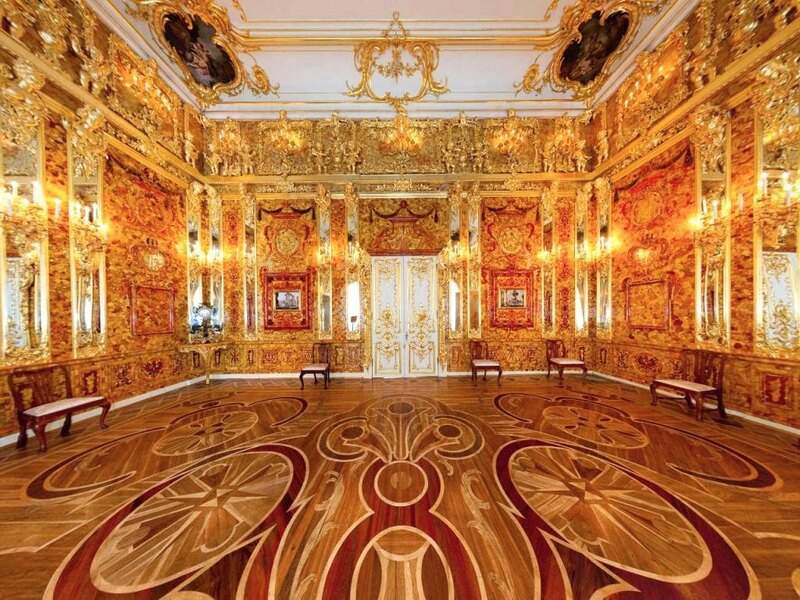 The (reconstructed) Amber Room. It didn't look this large in reality. Of course, outside the building is equally impressive, with a beautiful garden and the Hermitage Pavilion . The Hermitage Pavilion. The Pavilion was used for more intimate dinners, so the dining room was on the first floor and the food was prepared on the ground floor. The entire dining table was then raised from the ground floor to the first floor using a series of pulleys. This enabled the diners to enjoy their meal without being overheard. Time for a rest. All this sightseeing takes it out of you! From Catherine's Palace, we went on to The Hermitage, in central St. Petersburg. We actually visited twice, in the afternoon of the second day and the morning of the third day. We had expected to see different parts of the palace on the two days, but in the end, we saw the "highlights" twice. Given how crowded the place was, this wasn't a bad thing. Both visits are illustrated here. Waiting for our "early morning sneak peek" into The Hermitage on the second day. And a Rembrandt : " Return of the Prodigal Son"
Commissioned by Empress Catherine II in the late 1780's the Raphael Loggias are a copy of the Gallery in the Papal Palace in Vatican City. A highly painted ceiling in one of the galleries. That was the end of day 2. On day 3, we went back to the Hermitage and did the highlights tour again. Those photos are incorporated above. We finished at the Hermitage around noon and went back to the ship for a relaxing afternoon. The ship was supposed to leave at 4:00pm but high winds made maneuvering difficult so we didn't get away until almost 7:00 pm.